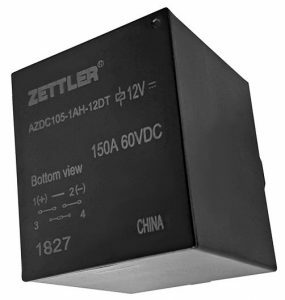 American Zettler responds to increasing DC power demand with AZDC105 | American Zettler, Inc.
Aliso Viejo, California, USA, 13 July 2018 -In response to an increasing demand for DC power switching and high power battery charging, American Zettler is proud to release the AZDC105 series relay. The AZDC105 is the first in what will be a large family of relays designed to switch a variety of DC loads. Recently, it seems everything has a battery. As battery sizes increase, the problem becomes how to safely isolate the batteries from their charging circuit in the event of a fault. The AZDC105 is rated to 150A@60VDC by both UL and TUV, and it has Class F insulation standard to maintain integrity at high temperatures. This PCB-mounted relay features internal magnets for arc-extinguishing, thus allowing for an extended life expectancy. A wide (3.0mm) contact gap and a 1 form X (double make) contact configuration help the AZDC105 to maintain a contact-to-contact dielectric strength of 4kV. The AZDC105 is ideal for high draw DC applications such as: battery operated carts; inverter pre-charging; refrigerated transport; and electric vehicle charging. This entry was posted in Application Spotlight by ZETTLER Announcements. Bookmark the permalink.